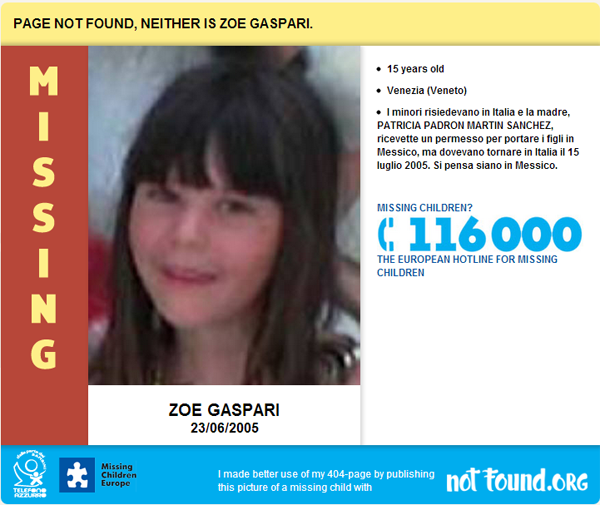 If you’re looking to make better use of your 404 pages, you may want to consider using them to help the NotFound project locate the thousands of children who go missing every year across Europe alone. By installing the Notfound application, a picture of a missing child will be posted on every 404 page of your website (hopefully there aren't too many 404 errors). Currently, only European cases are displayed but plans to include USA and Canadian cases are in the works. This will allow the distribution of the maximum number of photos, and help all missing children find their way home. More than 3,000 websites are already helping and since the start of the project, posters of missing children were displayed more than 900,000 times on a 404-page. For more information visit www.notfound.org and see example below.